Deactivating your account permanently removes your profile from Twitter. Note that deactivated profiles may take up to 30 days to clear from Twitter internal systems. While the deactivation is being completed, usernames or email addresses cannot be used in the creation of new accounts. 1 This is final and permanent. 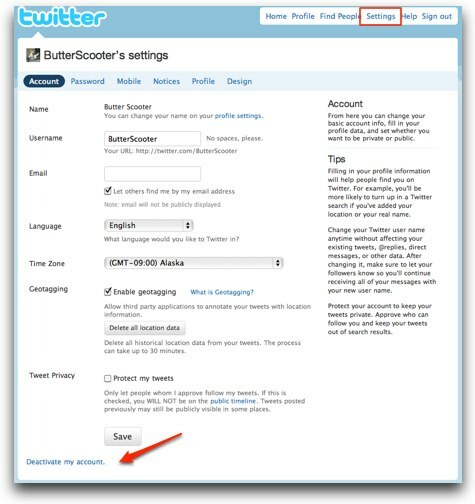 2 You do not need to deactivate your account to change your username; change it in account settings. 3 If you think you’ll use the same phone number, username and/or email address on a future account, change them on the account before you deactivate it. 4 Account restoration is not available. 4 Verify that you really want to do it and voila, it’s done. How to delete your Orkut account permanently?